It doesn’t feel like if from this angle, but Gilmorehill, which the University if Glasgow sits upon, is one of the highest hills in the city, and, at 85m, the tower of the University is not only one of the tallest buildings in the city, but being so high up, it’s also (elevationarily speaking) one of the tallest points in Glasgow. Sometimes, as a photographer, you see a view you want to capture, but you’re waiting for that little something to make it special. The seagull is that little something special. Took forever to catch a bird flying through the shot, and I almost missed it. 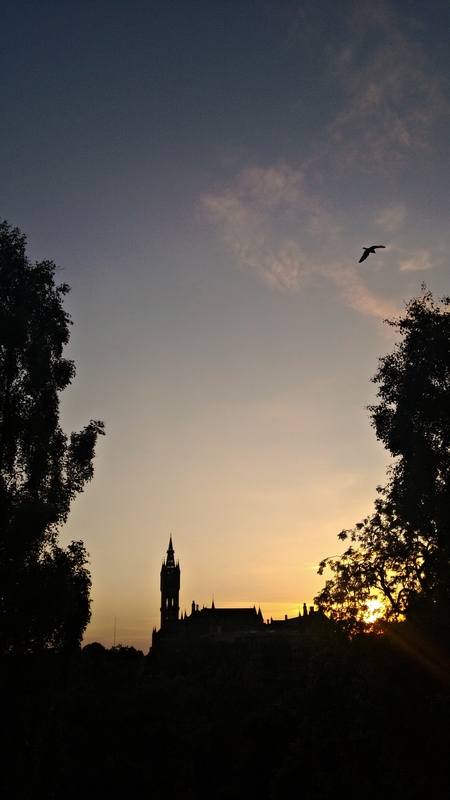 This entry was posted in 2013, Glasgow, June, Photos, Scotland, University of Glasgow and tagged 2013, 365 Photos, Gilmorehill, Glasgow, Glasgow University, June, June 2013, Scotland, Seagull, Sunset, Tower, University of Glasgow, University Tower. Bookmark the permalink.